Let's face it, when the enemy attacks, it can be hard to remember which way is up. Demonic forces can come in like a flood and disorient your mind. They can drown you in hopelessness. Or you may be tempted to turn a blind eye to the spirits that intend to kill, steal, and destroy you. But let it be known, the devil still wreaks havoc on the earth today, and followers of Christ must use Spirit-inspired strategies to drive him out. You need a battle plan. You need specific tactics for specific skirmishes because whether or not you know it, you are in a war. Jennifer LeClaire offers a practical battlefield manual that will remind you of the things one often forgets in the face of an enemy onslaught. Find rest in the midst of spiritual storms, break the power of Satan's devices, and live a life of victory. 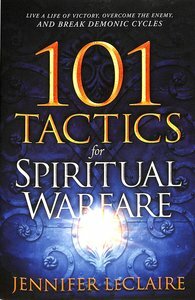 About "101 Tactics For Spiritual Warfare: Live a Life of Victory, Overcome the Enemy, and Break Demonic Cycles"